One pan of tailing soil was processed within 5 minutes in order to find the fine gold particles. Once fully understood, the process may be repeated over and over again with accuracy and certainty. It requires that a gold prospector or miner fully process the material and get a feeling of how much gold is inside there. And then by comparing those tests one may get a feeling of the ratio. In the same time I am mentioning accuracy and certainty, and then there is the contradiction that one need to get a feeling. Accuracy relates to the the quality of being near to the true value. It does not mean absolute, it is accurate, it is near the true value. By having the proper skill, experience, practice, one may gain the certainty to be able to detect the gold particles. 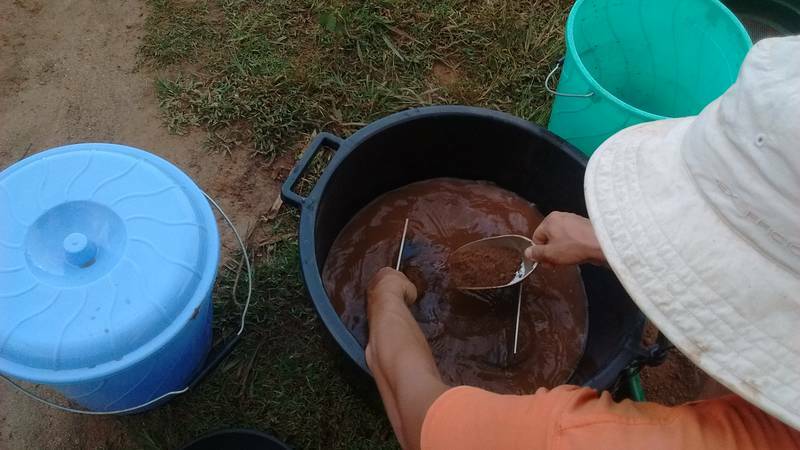 Then again, even 2 gold particles found by using the same method and same procedure on different soils, gravels, or ores, it can give us the result of 0.5 grams per tonne. With other type of procedure or slightly different method, even 200 particles indicate 0.5 grams per tonne. Sometimes only 2-10 fine gold particles may be seen by using magnifier, for the reason that such ore simply did not contain much of heavy minerals. And the other time one may find 200 particles indicating the same result, because the other type of ore may contain different heavy minerals that help in concentration of fine gold particles. Thus it is not just about the number of colors or fine gold particles, one need to observe also the type of the soil or sand that one is testing for gold.